I’d had a very early start from Rugby to get to Cadwell Park in time, somehow I managed to get there early so had plenty of time to get signed on and scout the back of the track (where the public aren’t allowed). Cadwell is split into to parts, from the start it is a large open loop round to the mountain, after which the track becomes very twisty through the woods, very Nurburgring-esque. It was the non publicly accessible wooded area that gave be the angle for this photo and quite a few more like it. At this part of the circuit you are slightly lower down than the cars, giving a great viewpoint and the backgrounds are largely uncluttered, this combined with the proximity to the cars allows for some great photos to be taken, certainly some of my favourite from 2008. This TR5 was in immaculate condition and the baby blue paint job sets it off nicely. Not only was it one of the best looking cars there, it won the Swinging Sixties race, which is why I went for this shot over a few of the others I found. That day I shot many images I was happy with, met up with some people I’d been meaning to see for a while and also got the chance to try out some new techniques. A bonus for the day was that I managed not to get sunburnt, frozen or rained on, the only race meeting where I didn’t suffer from at least one of those! I can’t wait for my next trip to Cadwell on the 18th April! 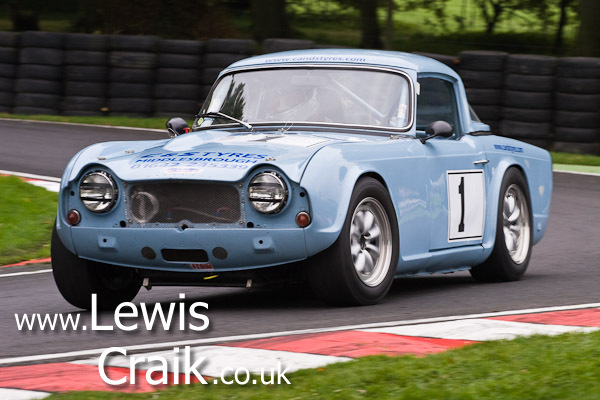 This entry was posted in Motorsport and tagged Cadwell Park, Photo, TR5 by Lewis. Bookmark the permalink.